Tags: Accelerator Science ( 835 ), CERN LHC ( 232 ), Fabiola Gianotti, HEP ( 1,085 ), Higgs ( 61 ), Joe Incandela, Symmetry Magazine ( 324 ), What comes next? 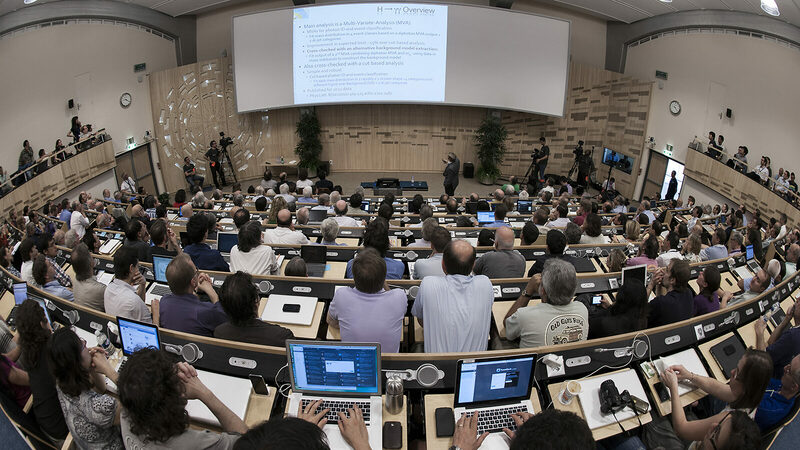 Joe Incandela sat in a conference room at CERN and watched with his arms folded as his colleagues presented the latest results on the hunt for the Higgs boson. It was December 2011, and they had begun to see the very thing they were looking for—an unexplained bump emerging from the data. “I was far from convinced,” says Incandela, a professor at the University of California, Santa Barbara and the former spokesperson of the CMS experiment at the Large Hadron Collider. For decades, scientists had searched for the elusive Higgs boson: the holy grail of modern physics and the only piece of the robust and time-tested Standard Model that had yet to be found. The construction of the LHC was motivated in large part by the absence of this fundamental component from our picture of the universe. Without it, physicists couldn’t explain the origin of mass or the divergent strengths of the fundamental forces. The Standard Model predicted the existence of the Higgs but did not predict what the particle’s mass would be. Over the years, scientists had searched for it across a wide range of possible masses. By 2011, there was only a tiny region left to search; everything else had been excluded by previous generations of experimentation. FNAL in the Tevatron research had ruled out many of the possible levels of energy that could have been the home of Higgs. If the predicted Higgs boson were anywhere, it had to be there, right where the LHC scientists were looking. But Incandela says he was skeptical about these preliminary results. He knew that the Higgs could manifest itself in many different forms, and this particular channel was extremely delicate. “A tiny mistake or an unfortunate distribution of the background events could make it look like a new particle is emerging from the data when in reality, it’s nothing,” Incandela says. A common mantra in science is that extraordinary claims require extraordinary evidence. The challenge isn’t just collecting the data and performing the analysis; it’s deciding if every part of the analysis is trustworthy. If the analysis is bulletproof, the next question is whether the evidence is substantial enough to claim a discovery. And if a discovery can be claimed, the final question is what, exactly, has been discovered? Scientists can have complete confidence in their results but remain uncertain about how to interpret them. In physics, it’s easy to say what something is not but nearly impossible to say what it is. A single piece of corroborated, contradictory evidence can discredit an entire theory and destroy an organization’s credibility. With all of that in mind, Incandela and his team made a decision: From that point on, everyone would refine their scientific analyses using special data samples and a patch of fake data generated by computer simulations covering the interesting areas of their analyses. Then, when they were sure about their methodology and had enough data to make a significant observation, they would remove the patch and use their algorithms on all the real data in a process called unblinding. “This is a nice way of providing an unbiased view of the data and helps us build confidence in any unexpected signals that may be appearing, particularly if the same unexpected signal is seen in different types of analyses,” Incandela says. A few weeks before July 4, all the different analysis groups met with Incandela to present a first look at their unblinded results. This time the bump was very significant and showing up at the same mass in two independent channels. Meanwhile, the other general-purpose experiment at the LHC, ATLAS, was hot on the trail of the same mysterious bump. Andrew Hard was a graduate student at The University of Wisconsin, Madison working on the ATLAS Higgs analysis with his PhD thesis advisor Sau Lan Wu. Hard was responsible for writing the code that selected and calibrated the particles of light the ATLAS detector recorded during the LHC’s high-energy collisions. According to predictions from the Standard Model, the Higgs can transform into two of these particles when it decays, so scientists on both experiments knew that this project would be key to the discovery process. At the end of June, Hard and his colleagues synthesized all of their work into a single analysis to see what it revealed. And there it was again—that same bump, this time surpassing the statistical threshold the particle physics community generally requires to claim a discovery. Hard had no idea whether CMS scientists were looking at the same thing. At this point, the experiments were keeping their latest results secret—with the exception of Incandela, Fabiola Gianotti (then ATLAS spokesperson) and a handful of CERN’s senior management, who regularly met to discuss their progress and results. Still, rumors were circulating around theoretical physics groups both at CERN and abroad. Mccullough, then a postdoc at the Massachusetts Institute of Technology, was avidly following the progress of the two experiments. The week before announcing what they’d found, Hard’s analysis group had daily meetings to discuss their results. He says they were excited but also nervous and stressed: Extraordinary claims require extraordinary confidence. After both groups had independently and intensely scrutinized their Higgs-like bump through a series of checks, cross-checks and internal reviews, Incandela and Gianotti decided it was time to tell the world. Science journalists rejoiced and rushed to publish their stories. But was this new particle the long-awaited Higgs boson? Or not? Discoveries in science rarely happen all at once; rather, they build slowly over time. And even when the evidence overwhelmingly points in a clear direction, scientists will rarely speak with superlatives or make definitive claims. Immediately after the July 4 announcement, theorists from around the world issued a flurry of theoretical papers presenting alternative explanations and possible tests to see if this excess really was the Higgs boson predicted by the Standard Model or just something similar. For the next several months, scientists continued to examine the particle and its properties. The more data they collected and the more tests they ran, the more the discovery looked like the long-awaited Higgs boson. By March, both experiments had twice as much data and twice as much evidence. To this day, scientists are open to the possibility that the Higgs they found is not exactly the Higgs they expected. 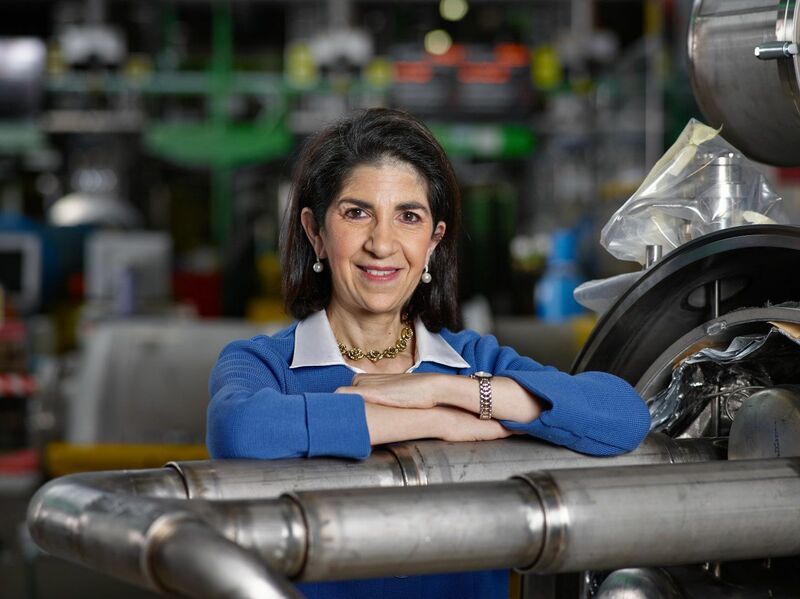 CERN director general Fabiola Gianotti looks at what lies ahead for particle physics. Fabiola Gianotti shot to prominence on 4 July 2012, with the announcement of the discovery of the Higgs boson. At the time, she was the spokesperson of ATLAS, which along with the Compact Muon Solenoid (CMS) experiment spotted the Higgs at the Large Hadron Collider (LHC) at CERN. In the excitement over the Higgs discovery, Gianotti was on the cover of Time. She was hailed as among the most influential and the most inspirational women of our time. She was listed among the “leading global thinkers of 2013” by Foreign Policy magazine. Gianotti first went to CERN in 1987 as a graduate student at the University of Milan. She has been there ever since. And she seems comfortable at the helm, a job she has held since the beginning of this year. 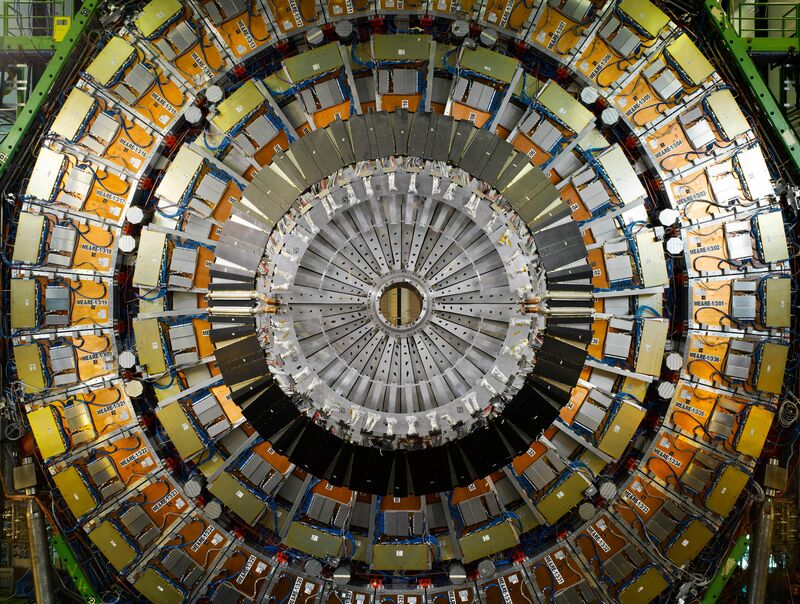 As of this summer, the LHC is in the middle of its second run, known as Run 2. In June the collider reached a record luminosity of 1034 cm−2s−1. It produces proton–proton collisions of energy of 13 TeV. A further push to the design energy of 14 TeV may be made later in Run 2 or in Run 3, which is planned for 2021–23. An upgrade following the third run will increase the LHC’s luminosity by an order of magnitude. Physics Today’s Toni Feder caught up with Gianotti in June, about six months into her five-year appointment in CERN’s top job. PT: Last fall the ATLAS and CMS experiments both reported hints of a signal at 750 GeV. What would the implications be of finding a particle at that energy? GIANOTTI: At the moment, we don’t know if what the experiments observed last year is the first hint of a signal or just a fluctuation. But if the bump turns into a signal, then the implications are extraordinary. Its presumed features would not be something we can classify within the best-known scenarios for physics beyond the standard model. So it would be something unexpected, and for researchers there is nothing more exciting than a surprise. PT: The LHC is up to nearly the originally planned collision energy. The next step is to increase the luminosity. How will that be done? GIANOTTI: To increase the luminosity, we will have to replace components of the accelerator—for example, the magnets sitting on each side of the ATLAS and CMS collision regions. These are quadrupoles that squeeze the beams and therefore increase the interaction probability. We will replace them with higher-field, larger-aperture magnets. There are also other things we have to do to upgrade the accelerator. The present schedule for the installation of the hardware components is at the end of Run 3—that is, during the 2024–26 shutdown. The operation of the high-luminosity LHC will start after this installation, so on the time scale of 2027. The high-luminosity LHC will allow the experiments to collect 10 times as much data. Improving the precision will be extremely important, in particular for the interaction strength—so-called couplings—of the Higgs boson with other particles. New physics can alter these couplings from the standard-model expectation. Hence the Higgs boson is a door to new physics. The high-luminosity LHC will also increase the discovery potential for new physics: Experiments will be able to detect particles with masses 20% to 30% larger than before the upgrade. And third, if new physics is discovered at the LHC in Run 2 or Run 3, the high-luminosity LHC will allow the first precise measurements of the new physics to be performed with a very well-known accelerator and very well-known experiments. So it would provide powerful constraints on the underlying theory. PT: What are some of the activities at CERN aside from the LHC? GIANOTTI: I have spent my scientific career working on high-energy colliders, which are very close to my heart. However, the open questions today in particle physics are difficult and crucial, and there is no single way to attack them. We can’t say today that a high-energy collider is the way to go and let’s forget about other approaches. Or underground experiments are the way to go. Or neutrino experiments are the way to go. There is no exclusive way. I think we have to be very inclusive, and we have to address the outstanding questions with all the approaches that our discipline has developed over the decades. In this vein, at CERN we have a scientific diversity program. It includes the study of antimatter through a dedicated facility, the Antiproton Decelerator; precise measurements of rare decays; and many other projects. We also participate in accelerator-based neutrino programs, mainly in the US. And we are doing R&D and design studies for the future high-energy colliders: an electron–positron collider in the multi-TeV region [the Compact Linear Collider] and future circular colliders. PT: Japan is the most likely host for a future International Linear Collider, an electron–positron collider (see Physics Today, March 2013, page 23). What’s your sense about whether the ILC will go ahead and whether it’s the best next step for high-energy physics? GIANOTTI: Japan is consulting with international partners to see if a global collaboration can be built. It’s a difficult decision to be taken, and it has to be taken by the worldwide community. Europe will produce a new road map, the European Strategy for Particle Physics, on the time scale of 2019–20. That will be a good opportunity to think about the future of the discipline, based also on the results from the LHC Run 2 and other facilities in the world. PT: How is CERN affected by tight financial situations in member countries? GIANOTTI: CERN has been running for many years with a constant budget, with constant revenues from member states, at a level of CHF 1.2 billion [$1.2 billion] per year. We strive to squeeze the operation of the most powerful accelerator in the world, its upgrade, and other interesting projects within this budget. PT: Will Brexit affect CERN? GIANOTTI: We are not directly affected because CERN membership is not related to being members of the European Union. PT: You have said you have four areas that you want to maintain and expand at CERN: science, technology and innovation, education, and peaceful collaboration. Please elaborate. GIANOTTI: Science first. We do research in fundamental physics, with the aim of understanding the elementary particles and their interactions, which also gives us very important indications about the structure and evolution of the universe. In order to accomplish these scientific goals, we have to develop cutting-edge technologies in many domains, from superconducting magnets to vacuum technology, cryogenics, electronics, computing, et cetera. These technologies are transferred to society and find applications in many other sectors—for example, in the medical fields with imaging and cancer therapy, but also solar panels, not to mention the World Wide Web. Fundamental research requires very sophisticated instruments and is a driver of innovation. Another component of our mission is education and training. The CERN population is very young: The age distribution of the 12 000 citizens from all over the world working on our experiments peaks at 27 years, and almost 50% are below 35. About half of our PhD students remain in academia or research, and about half go to industry. It is our duty to prepare them to be tomorrow’s scientists or tomorrow’s employees of industry—and in any case, good citizens. How do we prepare them to be good citizens? CERN was created in the early 1950s to promote fundamental research and to foster peaceful collaboration among European countries after the war. Today we have scientists of more than 110 nationalities, some from countries that are in conflict with each other, some from countries that do not even recognize each other’s right to exist. And yet they work together in a peaceful way, animated by the same passion for knowledge. PT: You are the first woman to head CERN. What do you see as the significance of this? GIANOTTI: The CERN director general should be appointed on the basis of his or her capabilities to run the laboratory and not on the basis of gender arguments. This being said, I hope that my being a woman can be useful as an encouragement to girls and young women who would like to do fundamental research but might hesitate. It shows them they have similar opportunities as their male colleagues. Fabiola Gianotti talks to Nature ahead of taking the helm at Europe’s particle-physics laboratory on 1 January. 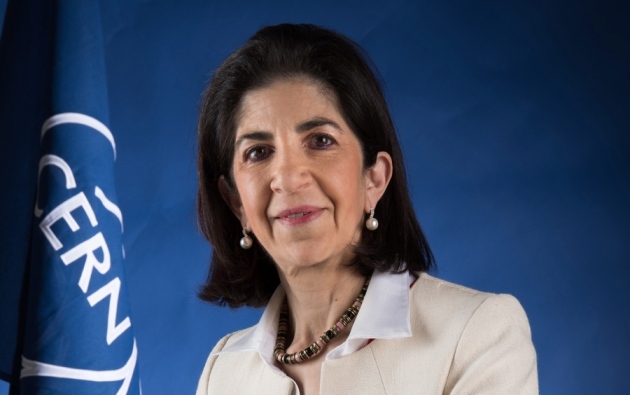 Fabiola Gianotti, the Italian physicist who announced the discovery of the Higgs boson in 2012, will from 1 January take charge at CERN, the laboratory near Geneva, Switzerland, where the particle was found. Gianotti spoke to Nature ahead of taking up the post, to discuss hints of new physics at the upgraded Large Hadron Collider (LHC), China’s planned accelerators and CERN’s worldwide ambitions — as well as how to deal with egos. How excited should we be about the latest LHC results, which already hint at signals that could turn out to be due to new physics phenomena? At the moment, experiments are seeing some fluctuations and hints, which, if they are due to signals from new physics, will next year consolidate with the huge amount of data the LHC will deliver. On the other hand, if they are just fluctuations, they will disappear. We have to be patient. In addition to looking for new physics, we are going to study the Higgs boson with very high precision. Will any of the hints that we’ve already seen be directing the physicists’ searches? I don’t think that the direction of exploration is being guided by the hints people see here and there. The correct approach is to be totally open and not be driven by our prejudices, because we don’t know where new physics is, or how it will look. Following the LHC’s energy upgrade, data collection in the 2015 run has been slower than hoped. How would you characterize it so far? Run 2 has been extremely successful. We have recorded about 4 inverse femtobarns of data [roughly equivalent to 400 trillion proton–proton collisions]. The initial goal was between 8 and 10 femtobarns, so it’s less. However, a huge number of challenges have been addressed and solved. So for me, this is more important than accumulating collisions. We could have accumulated more, but only by not addressing the challenges that will allow us to make a big jump in terms of intensity of the beams next year. In 2015, one LHC paper had more than 5,000 authors. There must be some people on such experiments who want more credit for their efforts. How do you deal with the clash of egos? I think the collaborations accept very well this idea that everybody signs the paper, and I am also a strong supporter of that. The reason is simple: you can be the guy who has a good idea to do a very cute analysis, so get very nice results. But you would not have been able to do the analysis if many other people had not built the detectors that gave you the data. None of these experiments is a one-man show, they are the work of thousands of people who have all contributed in their domain and all equally deserve to sign the paper. I hope that universities, advancement committees and boards that hire people understand that just because there are many authors, that does not mean the individual did not make an important contribution. CERN is currently at the heart of international particle physics, but China is designing a future collider that could succeed the LHC after 2035. Do you think that China could become the world’s centre for particle physics in the 2040s? At the moment there are many conceptual design studies for future big accelerators around the world. Of course conceptual studies are important, but there is a big step between studies and future reality. I think it is very good that all regions in the world show an interest and commitment to thinking about the future of particle physics. It’s a very good sign of a healthy discipline. Is there a chance that China might become a CERN member? Before becoming a full member, you become an associate member, and associate membership is something that can be conceived [for China]. So we will see in the coming years if this can become a reality. It’s an interesting option to explore. Do you plan to encourage more countries to become CERN members? Of course. A lot has been done since 2010 to enlarge CERN membership, in terms of associate members in particular, but also [full] members: we got Israel, for instance, and soon we will get Romania. I will continue along this direction. Some people think that future governments will be unwilling to fund larger and more expensive facilities. Do you think a collider bigger than the LHC will ever be built? And will it depend on the LHC finding something new? The outstanding questions in physics are important and complex and difficult, and they require the deployment of all the approaches the discipline has developed, from high-energy colliders to precision experiments and cosmic surveys. High-energy accelerators have been our most powerful tools of exploration in particle physics, so we cannot abandon them. What we have to do is push the research and development in accelerator technology, so that we will be able to reach higher energy with compact accelerators.